Get a FREE Network Assessment by the Pros at PCS! If you’re experiencing problems and performance issues with your computers and office network, we’ve got the SOLUTIONS! 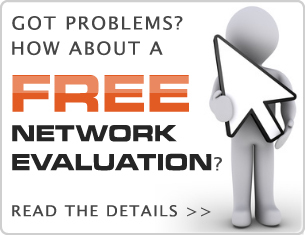 Please allow us to offer a Free, no-obligation, office network assessment and evaluation. Let us evaluate network security, data integrity, and show where improvements could be made to improve these aspects as well as overall operational efficiencies. This network ‘health’ assessment is Free to you, with our compliments, as our way of introducing ourselves and our gamut of services to you. To take advantage of this offer, please contact us by the method most convenient for you.